The warehouse environment is one of the most common places where forklift drivers work . Much like other areas- dockyards, ports and more- it has potential dangers. 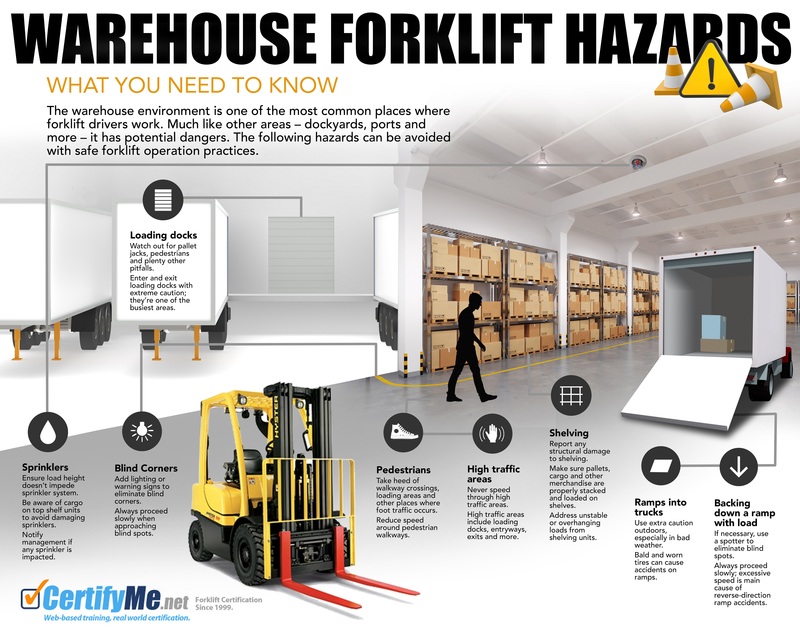 The following hazards can be avoided with safe forklift operation practices. Watch out for pallet jacks, pedestrians and plenty other pitfalls. Enter and exit loading docks with extreme caution; they’re one of the busiest areas. Ensure load height doesn’t impede sprinkler systems. Be aware of cargo on top shelf units to avoid damaging sprinklers. Notify management if any sprinkler is impacted. Add lighting or warning signs to eliminate blind corners. Always proceed slowly when approaching blind spots. Take head of walkway crossings , loading areas and other places where foot traffic occurs. Reduce speed around pedestrian walkways. Never speed through high traffic areas. High traffic areas include loading docks, entryways, exits and more. Report any structural damage to shelving. Make sure pallets, cargo and other merchandise are properly stacked and loaded on shelves. Address unstable or overhanging loads from shelving units. Use extra caution outdoors, especially in bad weather. Bald and worn tires can cause accidents on ramps. If necessary, use a spotter to eliminate blind spots. Always proceed slowly; excessive speed is main cause of reverse direction ramp accidents.